AutoCAD/LT for MAC 2014: It's here! The long anticipated 2014 release of AutoCAD for MAC was announced to all users on Subscription October 18, 2023. But no one could find it to download it (see HERE): but if you are on Subscription you can get it now, today, October 22, 2013. Would like to see camera / animation features. Material import ability. Usability in 3d, fix the bugs, bring it on par with Windows. Export layouts in pdf format. On windows platform the function seems pretty easy: different sizes sheets exporting in one pdf file. On mac all sheets can be combined in one pdf file but with the only one sheet size (A4, for example). It could be great to see selection filters, multiline styles and ole objects. Be able to Scale materials from the Material Browser for rendering, just as the Windows AutoCAD. All windows version functions with mac interface. Drawing Sync allows you to directly access your files from Autodesk 360 and synchronize them between your computer and the cloud (you will need to be signed in to Autodesk 360 first). Package Drawing (Similar to eTransmit command in AutoCAD for Windows) allows you to quickly collect related files into a compressed folder for easy distribution or storage. Autodesk has revamped the Welcome Screen to create a more-functional experience. Now it’s easier to work with files when creating a new drawing or working on an existing one. It also gives the user quick access to learning materials, cloud storage, and helps connect with other AutoCAD for Mac users so you collaborate, share information, and solve problems. Online Help: less cluttered and with focused search-based access to the information you need, mark pages for future reference and refine your search results by choosing the following topic types: Documentation, Installation & Deployment and Developer’s documentation. Print Preview is now added to the Print Dialog/pop-up. Default SaveAs format: it's now possible to set a default save-as version for your drawing. To set your save-as version, visit the Preferences dialog found in the AutoCAD menu. Software Security Enhancements: For non-LT users, it helps prevent loading and running of unauthorized or malicious AutoLISP applications. FIND command fixes: when searching a text in a drawing, the view will not switch back and will remain after the text found and located. It is more convenient to search a text in a big drawing. Hardware requirements have not changed much, most users will assume the low specs are acceptable until they use the software fully in production. AutoCAD WS, the highly successful free platform-independent DWG files viewer, markup, and collaboration tool, available as a mobile app (ideal for remote access and fieldwork), and also available as a web app (for easy sharing, drawings reviews, and collaboration), turns a new leaf today to show us a sneak preview into the CAD of tomorrow where loyalties to an OS become irrelevant and the choices of devices open up for all users. AutoCAD WS has a new name: AutoCAD 360. It now reflects the commitment Autodesk is making to the Cloud with the Autodesk 360 Service and Storage offerings. Look for this new AutoCAD 360 as a mobile app that will replace the old AutoCAD WS starting today from your mobile devices' app stores. New mobile features include a "smart pen" that helps you sketch ideas faster, simplify and improve fieldwork with some additional tools. AutoCAD 360 Mobile will be available in three versions: FREE, Pro, and Pro Plus. AutoCAD 360 Web App is also being introduced: released as a full public "beta" it has a redesigned user interface focused on ease of use and collaboration. Thus new app is HTML5 based and it will eventually replace the AutoCAD WS Web App eventually. Look for this new "360" branding to expand into all of Autodesk's web and mobile apps. FREE: This free version will not differ significantly from the old AutoCAD WS mobile app. You can easily view, edit and share DWG files from any smartphone or tablet running iOS or Android OS. Simplify site visits (take your drawings with you, not a big roll of paper); fast and easy design review for your client, partners and supervisors; collaborate with team members remotely, even access the same drawings on the web on any computer with a browser. Plus 5Gig of free storage. PRO: starting at $4.99/month (or $49.99/year), you gain access to more tools. You can create new drawings from scratch; larger file support (30MB DWG files); easily view, markup and edit drawings from popular sites like Dropbox, Box, Egnyte, Buzzsaw and custom WebDAV connections; addition of coordinates points for better drawing accuracy; Arc and Arrow drawing tools added; more drawing tools like Extended Vertex, Offset and Mirror; advanced Layer management (add, rename, isolate, invert and lock); view object properties (layer, length, area); view, edit and add block attributes; access a drawing's blocks to add and place in the file; more measuring and dimensioning tools; AND Priority Support (you are paying for it after all. Plus free storage up to 25Gig. PRO PLUS: for $99.99/year, you get all the features of the PRO version, with drawing files size increase to 40MB and access to 100Gig of storage. Visit your mobile device's apps store to download the free app and find out for yourself. Or explore it all now at http://www.autocad360.com (replaces the old site at http://www.autocadws.com), sign up for free account and see where the future of CAD is headed whether you are ready for it or not. Be aware though: you need to use a modern webbrowser like Google Chrome for best results. ONLINEUPLOAD: Replaced by ONLINEOPENFOLDER. In addition, the automatic upload process has been revised. It is now turned on or off for all drawings in the Options dialog box, Autodesk 360 tab. OPENONMOBILE, which sent a notification to your mobile devices for opening the current drawing: Notification is now handled by email. ONLINEDOCUMENTS, which Stores whether you can open and save drawing files directly to your Autodesk 360 account, has been removed. DESIGNFEEDCLOSE: Closes the Design Feed palette. DESIGNFEEDOPEN: Opens the Design Feed palette. FILETAB: Displays the File tabs at the top of the drawing area. FILETABCLOSE: Hides the File tabs at the top of the drawing area. GEOLOCATEME: Displays or hides an indicator that shows your current position. GEOMAP: Displays a map from an online maps service, in the current viewport. GEOMARKLATLONG: Places a position marker at a location defined by a latitude and longitude. GEOMARKME: Places a position marker in model space at the spot corresponding to your current position. GEOMARKPOINT: Places a position marker at a specified point in model space. GEOMARKPOSITION: Places a position marker at a location you specify. GEOREMOVE: Removes all geographic location information from the drawing file. GEOREORIENTMARKER: Modifies the orientation and position of the geographic marker without changing its latitude and longitude properties. INSERTSEARCHOPTIONS: Controls settings for working with AutoComplete and AutoCorrect suggestions on the command line. ONLINEOPENFOLDER: Opens your local Autodesk 360 folder in Windows Explorer. CGEOCS: Stores the name of the GIS coordinate system assigned to the drawing file. CLAYOUT: Sets the current layout. DESIGNFEEDSTATE: Indicates whether the Design Feed palette is open or closed. DIMCONTINUEMODE: Determines whether the style of a continued dimension is based on the dimension that is being continued or on the current dimension style. FILETABPREVIEW: Controls the type of preview, list view or thumbnail view, when you hover over a file tab. FILETABSTATE: Indicates the display status of the file tabs at the top of the drawing area. FILETABTHUMBHOVER: Specifies whether the corresponding model or layout loads in the drawing window when you hover over a file tab thumbnail. GEOMARKPOSITIONSIZE: Specifies the scale factor to use for point objects and multiline text objects when creating position markers. HPPICKMODE: Sets whether the default method for identifying what to hatch is to select a point or to select an object. INPUTSEARCHDELAY: Sets the number of milliseconds to delay before the command line suggestion list is displayed. TOUCHMODE: For those using a touch-enabled screen or interface, controls the display of the Touch panel on the ribbon. TEXTJUSTIFY: Displays the default justification used by the TEXT command to create single-line text. The New Command Line interface, docked or floating, has been enhanced in AutoCAD/LT 2014 to provide easier, more efficient access to commands, system variables and to find other content such as blocks, hatch patterns, visual styles, and Internet help if needed. AutoCorrect. If you mistype a command, instead responding with “Unknown command”, AutoCAD/LT autocorrects to the most relevant and valid AutoCAD command. For example, if you accidently type TABEL, the TABLE command is automatically launched. you type SETTING on the Command line, the suggestion list displays commands containing the word SETTING anywhere within it, not just at the beginning. Adaptive Suggestion: As you continue to use AutoCAD/LT, the order of commands in the suggestion list will adapt to your own usage habits. The command usage data is stored in the profile and adapts to each user. The Command line now has a built in synonym list. Enter a word at the command line and it will return a command if a match is found in the synonym list. For example, if you enter Symbol, AutoCAD finds the INSERT command so you can insert a block. Or if you enter Round, AutoCAD finds the FILLET command so you can add a fillet to a corner. And YES, you can add your own words to the AutoCorrect and Synonym lists using the Edit Aliases tool from the Manage ribbon tab. You can quickly search for more information on a command or system variable in the suggestion list in an Internet Search. Move the cursor over the command or system variable in the list and choose the Help or Internet icons to search for relevant information. You can use the command line to access layers, blocks, hatch patterns/gradients, text styles, dimension styles and visual styles. For example, if you enter Door at the command line and the current drawing has a block definition with the name Door, you can quickly insert it right from the suggestion list. To make the suggestion list easier to navigate, system variables and other content are organized into expandable categories. You can expand a category to see the results or press the Tab key to cycle through each category. You can customize the behavior of the command line using controls in the Input Settings menu when you right‐click on the command line. In addition to the previous options to enable AutoComplete and search for system variables, you can enable AutoCorrect, search content and mid‐string search. All of these options are turned on by default. Yes, that does mean you need to use that right-click mouse button for more than . Much of the new command line functionality including AutoCorrect, mid-string search, and adaptive suggestions is also available using dynamic input. Today Autodesk will officially share all the hidden secrets and more for their entire 2014 products, including our favorite LT2014, so visit Autodesk's LT Webpage for all the glossy presentations. Supported Operating Systems for AutoCAD/LT 2014: Microsoft® Windows XP Professional SP3, Microsoft® Windows XP Home SP3 (32-bit only) , and 32bit-64bit versions of Microsoft Windows 7 Enterprise, 7 Ultimate, 7 Professional, 7 Home Premium, Microsoft Windows 8, 8 Pro and 8 Enterprise. If you are using a Windows 8 touch-enabled screen, you can benefit from smoother pan and zoom performance. A new control on the System tab of the Options dialog box displays a touch mode ribbon panel when a touch screen device is detected. The Touch ribbon panel enables you cancel the current command and returns you to the Select/Command prompt. Hardware Requirements: sadly, they still publish low end "minimum requirements" that really don't allow this software to shine. So instead of repeating them here, we will just move on. Cloud sharing is here to stay: renamed Autodesk 360 also has some new usage and legal language that acknowledges your privacy, privacy of your files, and your complete ownership of your files. Log on and read the fine print even in LT2013 if you did not get the email that was released last week. Autodesk 360 includes a new Open Folder tool for easy access to the Autodesk 360 folder on your local machine and the new Design Feed enables you to enter posts and Images for a drawing tgat can be shared online. The commandline is here to stay with some really great new abilities: look for a separate post on many of these new and exciting features. Files tabs: built into AutoCAD/LT 2014 release, they offers drawing tabs as a fast and visual way to switch between open drawings or to create new ones. You can turn the file tabs bar on or off using the File Tabs control on the View ribbon tab. When File Tabs are turned on, a tab for each open drawing is displayed at the top of the drawing area.File tabs are displayed in the order they were opened. You can drag and drop tabs to change their order. A lock icon on a tab indicates that the file is open as read‐only and an asterisk indicates if the file has been modified since its last save. When you pass the cursor over a file tab, preview images of the model and layouts are displayed. Best feature: The right‐click menu for file tabs enables you to create, open, save and close files including the ability to close all open files except the one on which you right‐clicked. You can also copy the full file path to the clipboard or open the file location in Windows Explorer. A Plus (+) icon to the right of the drawing tabs, enables you to easily create new drawings, automatically adding their tabs as they are created. Layer Manager: The number of layers displayed on the ribbon has been increased. Layers are now displayed using natural ordered sort. For example, the following layer names 1, 4, 25, 6, 21, 2, 10 are sorted as 1, 2, 4, 6, 10, 21, 25 instead of 1, 10, 2, 25, 21, 4, 6. A new Merge option in the Layer Manager enables you to select one or more layers from the layer list and merge the objects from those layers onto a different layer. The original layers are automatically purged from the drawing. 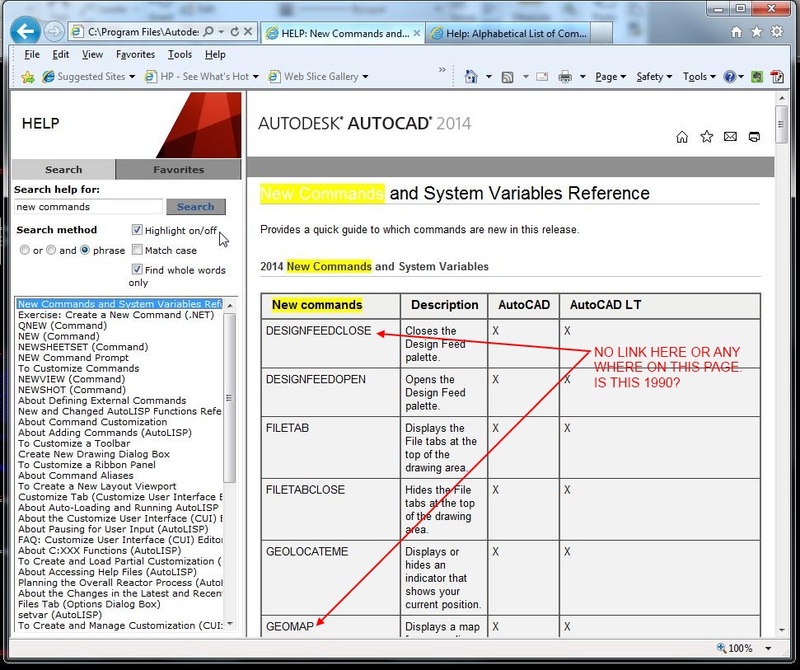 Xref Enhancements: The display of linetypes and layers from externally referenced drawings is enhanced in AutoCAD/LT 2014. Xref linetypes are not displayed in the linetype list of the ribbon or Properties palette. Xref layers are still displayed in the ribbon so you can control their visibility but they are not displayed in the Properties palette. You can easily change the attachment type for an xref between Attach and Overlay by double‐clicking in the Type column. A new option in the right‐click menu enables you to change the xref type for multiple selected xrefs at the same time. The External References palette includes new tools to easily change the path of selected xrefs between Absolute and Relative. You can also remove the path completely. The –XREF command includes a new PATHTYPE option enabling you to automate these path changes through scripting. Geographic Location, similar to abilities found in AutoCAD MAP have been added: this feature and it's uses will be explored in a future blog. Arcs: Easily draw an arc in either direction using by pressing the Ctrl key to switch directions as you draw. Polylines: the ability to fillet a polyline to itself, creating a closed polyline, has been added. Sheet Sets: When creating a new sheet in a sheet set the CreateDate field stored in the associated template (.dwt) displays the creation date of the new sheet rather than the creation date of the template file. Plot Styles: the CONVERTPSTYLES command is enhanced to support style names with spaces. Single line text is enhanced to maintain the last justification setting until it’s changed. The new DIMCONTINUEMODE system variable provides you with more control when creating continued and baseline dimensions. When DIMCONTINUE is set to 0, the DIMCONTINUE and DIMBASELINE commands create dimensions based on the current dimension style. When set to 1, they apply the dimension style of the selected dimension. The Hatch tool on the ribbon maintains the previous method for selecting objects to hatch: Pick internal point or Select objects. The Undo option is added to the command line. Design Feed: accessible from the Autodesk 360 ribbon tab, displays a palette in which you can enter text messages and attach images to be shared online with colleagues, clients, and consultants through Autodesk 360. Posts appear with related drawings on the desktop, on the web, and across mobile devices.You can associate your message with a location or area within the drawing. In the example below, the first post was associated with an area and indicated with a design feed bubble. The settings button on the Design Feed palette lets you control the display of the bubbles.You can tag colleagues, clients, and consultants to notify them of your post; notifications will be sent to them by email and will also appear within AutoCAD. After you finish creating a post, it is saved to your Autodesk 360 account with the drawing, along with any images that you attached. Using Autodesk 360, the people that you have authorized can view the drawing and its associated posts, and the people that you have tagged can post replies. When the questions in a post and its replies are no longer active, you can resolve the thread to hide it in the Design Feed palette. 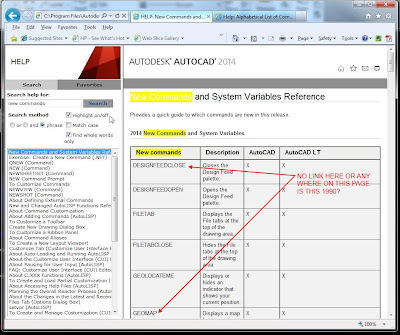 AutoCAD/LT 2014 offers improved access to online Help, particularly when using proxy servers. HELP in LT2014 has an improved Search feature that seems to work well, see screenshot below. Sadly the results are still disconnected, links are not intuitive, referenced additional commands are not easy to seek and more. The huge mess that was LT2013 seems to have been carried over to LT2014. Stay tuned for more information about LT2014 today and in the near future right here.